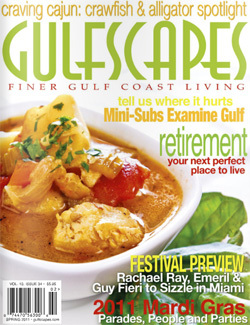 We were recently honored to be featured in the Spring 2011 issue of Gulfscapes Magazine. Photographer Terrell Clark worked with the Publisher Victoria Rogers on the photo selections for the article and the result is a beautiful spread that highlights our journey to the coast in August 2010. The story and photo essay can be found on page 39 and viewed through the widget below. To purchase a print copy of the magazine, click here to find a store near you. Special thanks to Victoria Rogers at Gulfscapes for recognizing our work and featuring the story for her readers.